Roasting vegetables and adding balsamic vinegar is certainly not a new idea, so if you've come across this and not seen it before, great! 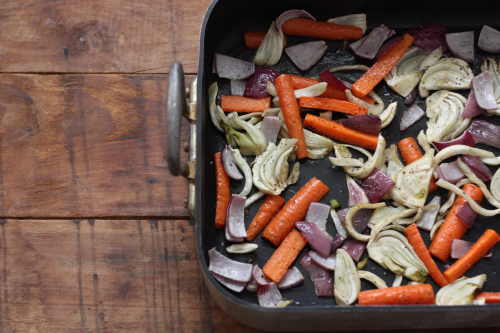 My main reason in posting this simple recipe was to show an easy way to roast some healthy vegetables on Sunday for use as side dishes later in the week. 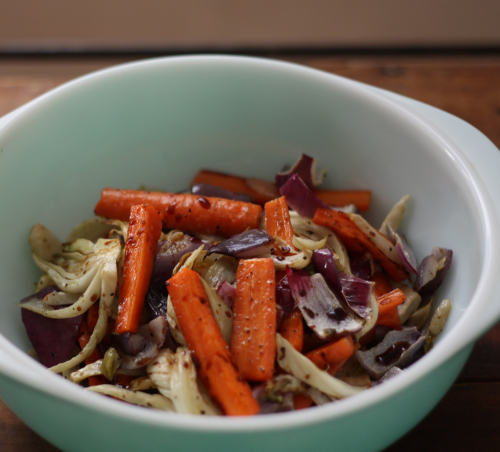 I had fennel, red onion and carrots on hand so that's what I used! Preheat the oven to 400 degrees and place the vegetables in a broiler pan. Drizzle them with 3 to 4 tablespoons of olive oil and add salt and pepper. 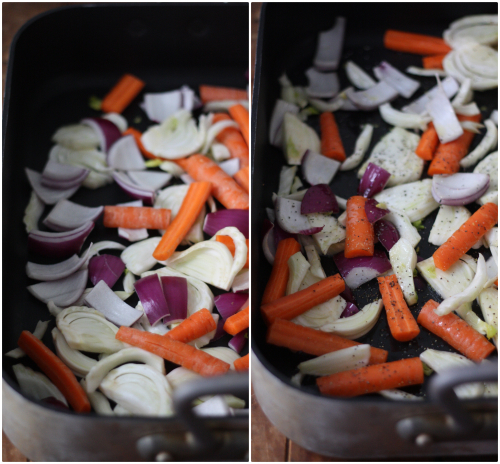 Stir the vegetables to coat and place in the oven for 25-30 minutes, stirring the vegetables again half way through. When removing from the oven, place them into a bowl while they are still warm. 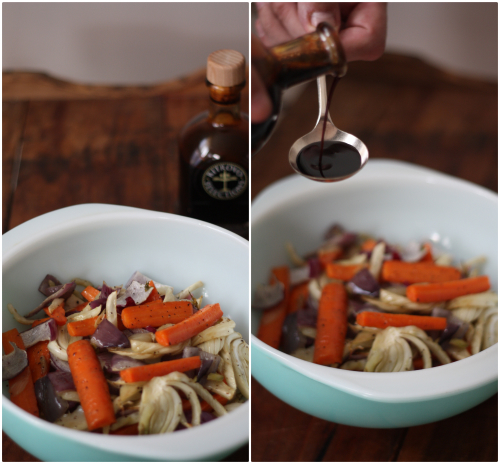 Drizzle one tablespoon of quality balsamic vinegar. I used an aged balsamic vinegar from Maletti. 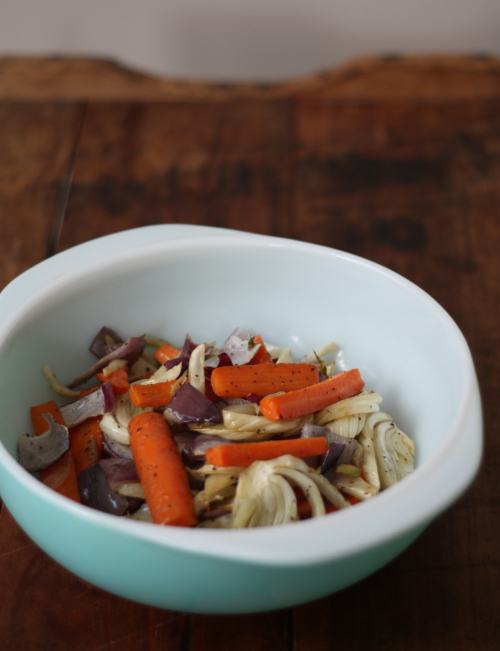 Stir the vegetables and vinegar to combine and enjoy now or later in the week as a perfect side to really any meal. What vegetables do you have on hand that would help you clean out the fridge and provide a meal later in the week? Looks delicious!! This is on my menu for Sunday's dinner! Thanks and looking forward to hearing how it turns out! I love doing up vegetables in a new way. It is so hard to find ways to dress up a simple vegetable in a way that everyone loves and will continue to enjoy on a daily basis! I thought I would also share with you something I tried the other evening, Cauliflower Mash. SO MUCH BETTER THAN MASHED POTATOES! You are an inspiration to my cooking :) Thank you! Wow Mary, you have made my day thanks so much for the kind words! Your cauliflower mash looked amazing! I have linked another variation of a mash I have made just in case you had not seen it!